98 metre Abeking & Rasmussen yacht Aviva was spotted making her way up the Thames in London on July 2, 2018. The yacht, which was last seen in New York just a month ago, passed some of the British capital's famous riverside landmarks before finally anchoring in front of Tower Bridge. Delivered in 2017, Aviva was designed by Reymond Langton Design and offers accommodation for up to 16 guests. Her roomy 17.2 metre beam makes room for a number of impressive lifestyle features, including a full-size padel court, which won her a Judges' Special Award at the World Superyacht Awards 2018. 98 metre Abeking & Rasmussen yacht Aviva was spotted making her way up the Thames in London on July 2, 2018. The yacht, which was last seen in New York just a month ago, passed some of the British capital's famous riverside landmarks before finally anchoring in front of Tower Bridge. Delivered in 2017, Aviva was designed by Reymond Langton Design and offers accommodation for up to 16 guests. Her roomy 17.2 metre beam makes room for a number of impressive lifestyle features, including a full-size padel court, which won her a Judges' Special Award at the World Superyacht Awards 2018. Andrey Melnichenko’s new 142.81 metre superyacht Sailing Yacht A was spotted in Puerto Portals, Mallorca in May 2018. Built by Nobiskrug and designed by Philippe Starck, she was delivered in February 2017 and is one of the largest superyachts in the world. After completing sea trials in the Med in 2017 she has remained in her favourite cruising ground, making appearances in La Spezia, Formentera, Cyprus and other superyacht hotspots. She is one of the most talked about yachts in the world, famed for her distinctive design and extraordinary sails, with an interior that remains shrouded in secrecy. She recently won the award for Best Sail-Assisted Motor Yacht at the World Superyacht Awards 2018. Andrey Melnichenko’s new 142.81 metre superyacht Sailing Yacht A was spotted in Puerto Portals, Mallorca in May 2018. Built by Nobiskrug and designed by Philippe Starck, she was delivered in February 2017 and is one of the largest superyachts in the world. After completing sea trials in the Med in 2017 she has remained in her favourite cruising ground, making appearances in La Spezia, Formentera, Cyprus and other superyacht hotspots. She is one of the most talked about yachts in the world, famed for her distinctive design and extraordinary sails, with an interior that remains shrouded in secrecy. She recently won the award for Best Sail-Assisted Motor Yacht at the World Superyacht Awards 2018. The 63 metre Lürssen explorer yacht Polar Star has been spotted in the Silo Marina in Auckland (February 22), having departed from Westhaven on February 17. She was previously seen in Tauranga on February 6. Delivered in 2005, her onboard highlights include a massage room (formerly an office), an elegant main saloon complete with fireplace, a beautiful forward-facing master cabin and a gym. It is not know exactly where she will be heading next, but perhaps she will continue to discover the best of New Zealand. The 63 metre Lürssen explorer yacht Polar Star has been spotted in the Silo Marina in Auckland (February 22), having departed from Westhaven on February 17. She was previously seen in Tauranga on February 6. Delivered in 2005, her onboard highlights include a massage room (formerly an office), an elegant main saloon complete with fireplace, a beautiful forward-facing master cabin and a gym. It is not know exactly where she will be heading next, but perhaps she will continue to discover the best of New Zealand. 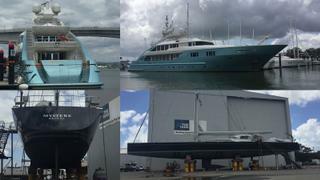 The 70.41 metre Amadeus Yachts Felix has been spotted in Port Adelaide, South Australia. She arrived on February 13 after wending her way down the east coast, where she made stops in Sydney and Hobart. Once available for charter under the name Amadeus, she boasts a cinema, gymnasium and a golf driving range. She can sleep up to 12 guests in six cabins and features interior design by Francious Zuretti. While it is not known for sure where she will be heading next, it is rumoured that she will continue her journey on to Port Lincoln. 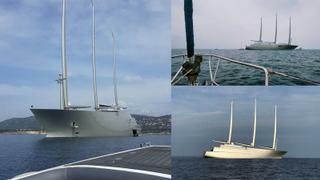 The 70.41 metre Amadeus YachtsFelix has been spotted in Port Adelaide, South Australia. She arrived on February 13 after wending her way down the east coast, where she made stops in Sydney and Hobart. Once available for charter under the name Amadeus, she boasts a cinema, gymnasium and a golf driving range. She can sleep up to 12 guests in six cabins and features interior design by Francious Zuretti. While it is not known for sure where she will be heading next, it is rumoured that she will continue her journey on to Port Lincoln. The 83 metre Amels superyacht Here Comes The Sun has been spotted in Rio de Janeiro (February 9) after departing from Ilheus on February 4. She arrived in Brazil at the end of January, calling first in Salvador. Prior to Brazil, Here Comes The Sun was seen off the coast of Antilles in the Caribbean, and was also spotted last September off Gibraltar and Civitavecchia in Italy. Delivered in 2016, she boasts exterior styling by Tim Heywood and interiors by Winch Design. Currently available for charter with Fraser, she boasts a beautiful spa, a private owner's deck and some extraordinary lounge spaces, as well as a helipad and a vast superyacht pool. It is not known where she will be heading next, but it is thought that she will be spending the summer season in the Western Mediterranean. The 83 metre Amels superyacht Here Comes The Sun has been spotted in Rio de Janeiro (February 9) after departing from Ilheus on February 4. She arrived in Brazil at the end of January, calling first in Salvador. Prior to Brazil, Here Comes The Sun was seen off the coast of Antilles in the Caribbean, and was also spotted last September off Gibraltar and Civitavecchia in Italy. Delivered in 2016, she boasts exterior styling by Tim Heywood and interiors by Winch Design. Currently available for charter with Fraser, she boasts a beautiful spa, a private owner's deck and some extraordinary lounge spaces, as well as a helipad and a vast superyacht pool. It is not known where she will be heading next, but it is thought that she will be spending the summer season in the Western Mediterranean. On February 11 the Blohm & Voss 119 metre Motor Yacht A stopped off at the Jumeirah Vittaveli in the Maldives, where she has been cruising for the last few weeks. The private island retreat is home to the recently opened Royal Residence, which at $35,000-a-night is considered one the best hotel suites in the world. 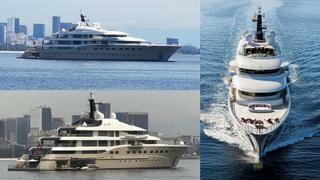 Motor Yacht A has also recently been spotted in Dubai and was rumoured to be in Oman in early January. Delivered in 2008, she was famously designed by the legendary Philippe Starck. It is not known where she will be heading next, but it looks like she will continue to explore the Maldives for some time. On February 11 the Blohm & Voss 119 metre Motor Yacht A stopped off at the Jumeirah Vittaveli in the Maldives, where she has been cruising for the last few weeks. The private island retreat is home to the recently opened Royal Residence, which at $35,000-a-night is considered one the best hotel suites in the world. 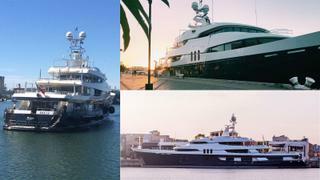 Motor Yacht A has also recently been spotted in Dubai and was rumoured to be in Oman in early January. 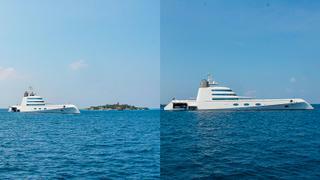 Delivered in 2008, she was famously designed by the legendary Philippe Starck. It is not known where she will be heading next, but it looks like she will continue to explore the Maldives for some time. Our first yachtspotter of 2018 is the formidable Feadship, 77.7 metre Tango. 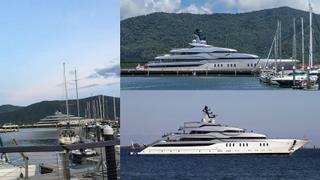 Delivered in 2011, she was spotted in Cairns Marlin Marina on January 12, where she stopped on her way to Singapore. Prior to Cairns, she was in Sydney earlier this month and spent the latter end of 2017 in Devonport and Auckland, New Zealand. She boasts exterior and interior styling by Eidsgaard Design and naval architecture by De Voogt. Our first yachtspotter of 2018 is the formidable Feadship, 77.7 metre Tango. 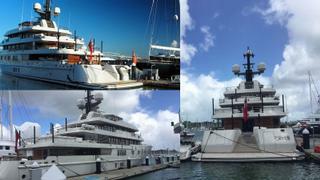 Delivered in 2011, she was spotted in Cairns Marlin Marina on January 12, where she stopped on her way to Singapore. Prior to Cairns, she was in Sydney earlier this month and spent the latter end of 2017 in Devonport and Auckland, New Zealand. She boasts exterior and interior styling by Eidsgaard Design and naval architecture by De Voogt. Arriving in Brisbane on November 13 from Vanuatu, the 43.2 metre sailing vessel Mystere was spotted out of the water, ready for some time at the yard. Delivered in 2006 by Vitters, she has accommodation for seven guests in four cabins and won best sailing yacht in 30 metre to 44.99 metre size range in the 2007 World Superyacht Awards. She has since gone back into the water and has stopped in Southport on route to Westhaven, New Zealand. 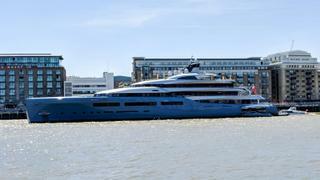 The 47.5 metre luxury yacht Aquamarina was also in Brisbane but has since made her way to Sorong in Indonesia. She was delivered in 2006 by ISA and can sleep up to 12 guests on board. Arriving in Brisbane on November 13 from Vanuatu, the 43.2 metre sailing vessel Mystere was spotted out of the water, ready for some time at the yard. Delivered in 2006 by Vitters, she has accommodation for seven guests in four cabins and won best sailing yacht in 30 metre to 44.99 metre size range in the 2007 World Superyacht Awards. She has since gone back into the water and has stopped in Southport on route to Westhaven, New Zealand. The 47.5 metre luxury yacht Aquamarina was also in Brisbane but has since made her way to Sorong in Indonesia. She was delivered in 2006 by ISA and can sleep up to 12 guests on board. The stunning 126.18 metre Lürssen superyacht Octopus arrived in the marina at Keppel Bay, Singapore, on October 10, having been cruising in local waters during summer for scientific research. On August 19, owner Paul Allen posted on Twitter that they had discovered the wreck of World War II cruiser USS Indianapolis in the Philippine Sea and at a depth of 5,500 metres. Delivered in 2003 as one of the largest explorer yachts in the world, Octopus boasts two submarines (both of which have been used for scientific expeditions), space for two helicopters on the aft deck and foredeck, an internal dock and space on board for 50 crewmembers. She is part of an eight-year search for sunken vessels – in 2015 they discovered the wreck of Japanese World War II ship Musashi. The stunning 126.18 metre Lürssen superyacht Octopus arrived in the marina at Keppel Bay, Singapore, on October 10, having been cruising in local waters during summer for scientific research. On August 19, owner Paul Allen posted on Twitter that they had discovered the wreck of World War II cruiser USS Indianapolis in the Philippine Sea and at a depth of 5,500 metres. Delivered in 2003 as one of the largest explorer yachts in the world, Octopus boasts two submarines (both of which have been used for scientific expeditions), space for two helicopters on the aft deck and foredeck, an internal dock and space on board for 50 crewmembers. She is part of an eight-year search for sunken vessels – in 2015 they discovered the wreck of Japanese World War II ship Musashi. After a summer spent cruising around the Mediterranean, making stops in Malaga, Antibes, Sardinia and Ibiza, the 92.42 metre superyacht Tatoosh was spotted in Gibraltar on October 22, departing two days later. She is now currently on route to Bonaire, having departed Curacao on January 17. 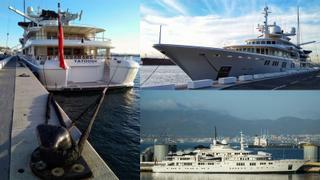 Delivered in 2000 by Nobiskrug, she is owned by Microsoft co-founder Paul Allen. Across five decks she features an observation lounge, fully-equipped gym, cinema, private office, diving room complete with decompression chamber and six cabins, which includes a vast full-beam owner's suite. Up on deck, there are two helipads, an al fresco basketball court and a swimming pool. After a summer spent cruising around the Mediterranean, making stops in Malaga, Antibes, Sardinia and Ibiza, the 92.42 metre superyacht Tatoosh was spotted in Gibraltar on October 22, departing two days later. She is now currently on route to Bonaire, having departed Curacao on January 17. Delivered in 2000 by Nobiskrug, she is owned by Microsoft co-founder Paul Allen. Across five decks she features an observation lounge, fully-equipped gym, cinema, private office, diving room complete with decompression chamber and six cabins, which includes a vast full-beam owner's suite. 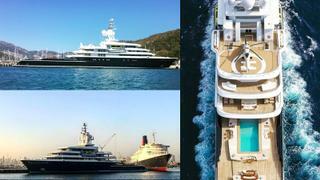 Up on deck, there are two helipads, an al fresco basketball court and a swimming pool. After departing from Marmaris in Turkey on October 13 (where she is pictured, top left and right), the stunning 115 metre Lloyd Werft superyacht Luna was spotted in Dubai (bottom left), where she arrived on October 24. It is thought that she made stops in Port Said and Portr Ibrahim in Egypt on route. She spend much of August in Greece and September cruising around the coastlines of Turkey, while earlier in the year she has been spotted in Costa Rica and Miami. The story of the explorer yacht's €50m refit, which began in 2014 and was complete 14 months later, saw her kitted out with a new hull paint job, new equipment in the gym, a spa area make over and a myriad other additions. Her famous superyacht swimming pool still sits at the heart of the aft deck surrounded by sunpads, making it the ideal spot of sun worshippers. 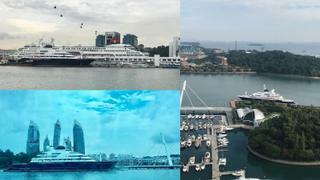 After departing from Marmaris in Turkey on October 13 (where she is pictured, top left and right), the stunning 115 metre Lloyd Werft superyacht Luna was spotted in Dubai (bottom left), where she arrived on October 24. It is thought that she made stops in Port Said and Portr Ibrahim in Egypt on route. She spend much of August in Greece and September cruising around the coastlines of Turkey, while earlier in the year she has been spotted in Costa Rica and Miami. The story of the explorer yacht's €50m refit, which began in 2014 and was complete 14 months later, saw her kitted out with a new hull paint job, new equipment in the gym, a spa area make over and a myriad other additions. Her famous superyacht swimming pool still sits at the heart of the aft deck surrounded by sunpads, making it the ideal spot of sun worshippers.